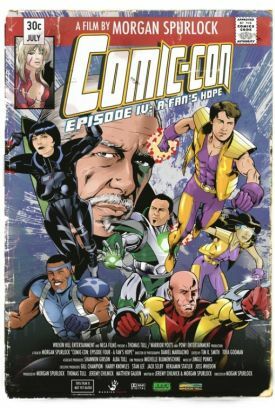 The most interesting thing about Comic-Con Episode IV: A Fan's Hope, a new documentary by Morgan Spurlock (Super Size Me), is how shy and even shamefaced its author is about those ironies which, in his hands, would once have been piquant if not slashing. Comic-Con, the annual gathering in San Diego of the nation’s most fanatical aficionados of comic books and the various forms of cartoon or cartoon-like entertainment that are made from them, is a natural subject for satire, but Mr Spurlock’s satirical sword appears to be blunted and his lance broken. Never hitherto reluctant to push himself in front of his own camera, here he hides from it like a nymph surprised at her toilette. We may deduce from this unaccustomed reticence that he is himself enough of a comix geek — or else he is so much in need of the cooperation of those who are — that he has to treat with the utmost sympathy and affection grown-up people who dress as superheroes or who travel thousands of miles to buy an "action figure" doll or those with real jobs who aspire, mostly in vain, to draw comic books for a living. Satire, it’s true, is often at its most effective when the satirist can reveal a sneaking sympathy with his victim, but there’s nothing sneaking about Mr Spurlock’s sympathy. It’s rather the satire that sneaks. Having reined in his sense of the ridiculous for most of the film, he lets it have its head only very briefly at the very end in a series of interview comments made by some of those who have appeared, up until this point, as geek-like as himself. The film ends with a comment by Kevin Smith, the barefoot and obese director of Clerks, Chasing Amy, Dogma, Jersey Girl et cetera, who could also be the prototype of Comic Book Guy on "The Simpsons," to the effect that, if he had been alive in the 1940s, he would perforce have had to concern himself in some way with the fact that the world was at war. Not anymore. "Now it’s: ‘Did you see they changed Wonder Woman’s pants?’ That’s f***** up." Not that there’s anything wrong with that. F***** up it may be, but one suspects that that’s sort of what he likes about comic fandom. The same goes for Morgan Spurlock. Mr Smith’s comment also casts an ironic light back on the little skit presented by Holly Conrad, a costume designer from San Bernardino, California, who has created an animatronic lizard-man as henchman to herself, dressed in a Catwoman suit, as the two of them perform for convention-goers an abbreviated drama called "Suicide Mission." Their sketch, like that of others who are more or less skilled at bringing cartoon figures to life, is mainly designed to show off the lizard-man, but it begins with an actor-announcer’s walking on stage and saying: "We’re at war. No one wants to admit it, but humanity is under attack." Yeah it is — and the alien enemy has already occupied San Diego. Holly is one of some half dozen attendees of the convention whom Mr Spurlock’s camera follows from their homes in places like Columbia, Missouri or Minot, North Dakota to the conventional Mecca in Southern California. Besides her there are a couple of aspiring cartoonists, one of whom gets a job at the convention, a collector of action figures, and a young couple who met at Comic-Con the year before and now want to get engaged there in front of Kevin Smith and a crowd of his fans. Then there is Chuck Rozanski, the 60-something proprietor of Mile-High Comics in Denver who comes to San Diego in the hopes of bailing out his business by the sale of an extremely rare, mint-condition copy of the first edition of the vintage Marvel Comic "Red Raven" of 1940 for half a million dollars. He doesn’t sell it there, but he sells enough of his other comic inventory to keep Mile High in business for a bit longer. Chuck seems to me the saddest of Mr Spurlock’s subjects because he is the oldest, but he is determined to remain a comic-book fan to the last. At one point he says, complaining of Nicholas Cage’s reportedly selling his comic collection at the behest of a fiancée, that "When a woman tells you to grow up, that’s God’s way of telling you to get a new woman. Especially if it means getting rid of your comics. There are three billion women on the planet, but only so many good comics, so the choice is an easy one." That would be the same God, I guess, whom Chuck hopes will send him not to heaven but to Comic-Con when he dies. We also see Chuck in a brief scene with his wife, before he goes off to the convention in the company of an assistant, a young girl with piercings. She, the wife, seems exactly the sort of woman who must have suggested to him on multiple occasions that it was time for him to grow up. She’s still around, too, though not at Comic-Con. "Any entertainment property that has a passionate following now belongs to Comic-Con," says Joss Whedon, one of the film’s writer-producers and creator of Buffy the Vampire Slayer, among other entertainment properties. As he sums up the commercial imperative for guys like Chuck and, perhaps, himself, it’s: "Let’s dig into the love and get the money out." I think it is also Mr Whedon who offers another of those late and played-down critical comments by characterizing the convention as an occasion to "get all the people who think everything’s going to be great and put them in the same room and have them say ‘Everything’s Going to be Great.’" Then he adds: "It’s the most depressing place on earth if you look at it that way." Needless to say, nobody here, least of all Morgan Spurlock, does look at it that way. But he and Mr Whedon are unlikely to be the only ones who have an inkling about that way of looking at it — and who must, therefore, feel obscurely guilty for living their lives in the realms of fantasy.